This is latest and most advanced unit in the line, it features 6 output channels and is manufactured in Japan. Compact, attractive, lightweight, sturdy and fits nicely on any desktop. Provides 8 stimulation modes and saves the settings from the last 5 sessions and incorporates 16 programmable memory settings. 3 LCD digital displays (0.6” x 1.4” and 0.6” x 1.1”) show point search sensitivity, frequency (Hz), pulse width (us), program modes, memory data, treatment time (minutes) and battery life. The hand probe includes a search to treat push button switch on the probe itself. Safety features include a self-test, zero start, automatic power off if its left unattended for 5 minutes and sound notice for power on/off. 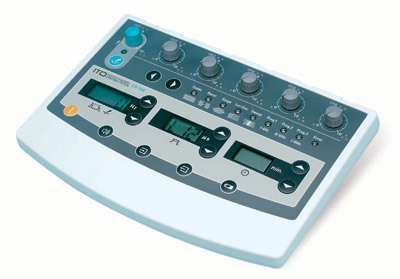 Also has an emergency stop button, hi/low voltage switch and it signals a tone to mark the end of a treatment. Accessories include search/ stimulation probe, 6 electrode cords, 12 alligator clip-on and an operation manual. Batteries are not included.